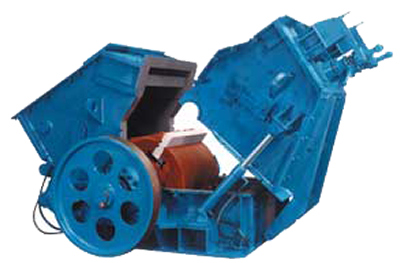 Primary Impactors give high reduction ratios with single stage crushing. Production rates in excess of 1,000 T.P.H. 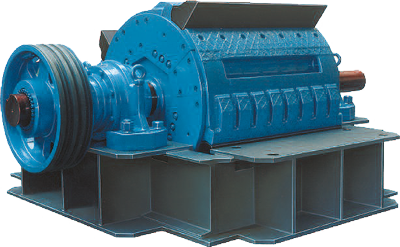 are achievable, depending on machine size, product required and characteristics of material. The solid rotor, fitted with boltless impeller bars ensures maximum impact. The breaker plate, fitted with wear resistant liners ensures correct sizing of material. 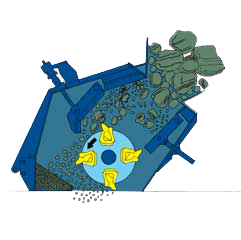 A shearpin device protects the machine from major damage should un-crushable items enter with the feedstock. 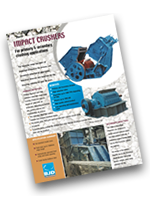 The range of Secondary Impactors are designed to further process material which has been primary reduced. If required a second breaker plate can be fitted to further reduce the material. The design of the boltless impeller bar on the Secondary Impact Breaker has a high chrome content, which gives extended bar life.